Many people can debate whether or not using sales scripts are a good thing. In this article we will outline why a very strong case can be made for how scripts can help you to get to the next level. As we start to discuss why a sales person should use a script, we will actually look at a non-sales related example. For this, stop to think about a news anchor that delivers the evening news. If you can picture this individual, your impression may be that the anchor speaks very well, seems very professional, fairly intelligent, knowledgeable on the subject that he or she is speaking about, etc. If that was anywhere close to your impression, it sounds like you might have had a fairly positive impression of this person. Now we need to point out that everything that anchor says is completely scripted. And not only is everything written out ahead of time, but the anchor likely has practice going through the material over and over again before going on the air. And on top of that, he or she also has a teleprompter in front of them displaying the script the entire time. Let’s now look at the other extreme of this example. Consider for a moment what it would look like if the news anchor read over the news of the day before going on the air and was fairly knowledgeable about what happened but did not have his or her thoughts listed out ahead of time as to what to say and just went on the air with an improvisational approach. What type of impression do you think this would make on you? You can apply this same dynamic to using sales scripts when meeting and talking with sales prospects. Not only can having some of your questions and statements prepared ahead of time help you to make a better impression, it can also help you to get more out of your interactions with prospects and that can lead to improved lead generation. There are different benefits that exist when a sales manager has his or her sales resources use scripts. The most common sales management approach is for a manager to give a sales resource training and then put him or her on the phone or in the field. Without a script, this sales person will likely learn through trial and error and somewhat “fake it till they make it”. This can be very costly as not only can it lead to missed opportunities but it can also add to the level of sales staff turnover. By simply implementing some type of scripts for sales situations, a sales manager can better control what is going on when the sales resources are talking with prospects. This can not only improve overall sales performance, but it can also decrease the level of stress that the sales resources are experiencing. When the sales resources are selling more, making more money, and are less stressed, a sales manager can expect to see a decrease in sales staff turnover. 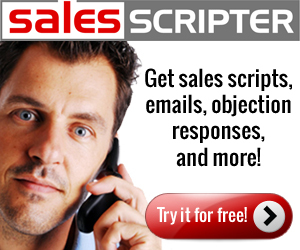 SalesScripter provides sales messaging tools helping sales pros to develop sales scripts.